All the interested candidates searching on internet open 10th admissions 2016-17,open 10th exam fee last date 2017,open 10th fee details,fees structure,aposs 10th fee structure for remittance of AP Open 10th fees 2017.So candidates are advised read carefully complete article in this web page. A.P.OPEN SCHOOL SOCIETY, ANDHRA PRADESH, GUNTUR. FEE DUE DATES FOR SSC & INTERMEDIATE (APOSS) PUBLIC EXAMINATIONS, APRIL, 2017.
i. The candidates who have enrolled for open 10th during the academic year 2016-2017.
ii. 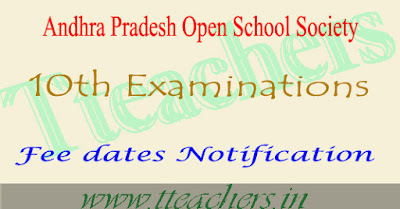 The candidates enrolled for open 10th during the previous years and appeared for the for ap open 10th exams but failed. iii. The candidates enrolled for open 10th during the previous years but not appeared for open 10th exams so far. Submission of NRs by the DCs in the Head Office. 2. If for any reason the Government declares holiday on the last date of the open 10th examination fee remittance the immediate next working day is to be reckoned as the remittance date. 3. All the PH Candidates are exempted from payment of aposs open ssc examination fee 2017. But they have to pay service charges against a receipt duly indicating the subjects that the candidate wish to appear.